It seems unreal just writing it down. Ten senior club debuts by youngsters at Sheffield Wednesday within the last year. Near enough a whole team. Hard to check without losing a week’s sleep but when was the last time that happened? If ever? Or anywhere else come to that. And the majority of those debuts came within the eight month reign of Jos Luhukay. Simply an extraordinary statistic – especially at a club not noted for producing its own talent across the modern era. A prominent ex player, who took much the same route back in the 1980s, firmly believes it has helped reconnect the team and fans in the wake of commendable heavy investment on experienced players which left the club unluckily just short of promotion – and patience in much shorter supply. “The supporters can identify with the young players because they’re local and it is a fantastic thing,” says former goalkeeper Kevin Pressman, who spent six years in the management team at Millwall up to this summer and understands how being overstocked with senior players can backfire. Always allowing, says Pressman, for “getting the right balance” and new deals for Barry Bannan and Lucas Joao have been rightly heralded. As have the loan arrivals of Josh Onomah and Michael Hector. Wednesday are back in a good place after three successive victories. But the real turning point came earlier, achieved by Luhukay’s transformation of a negative into a positive with the promotion of youth. 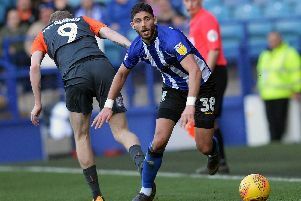 He also backs Luhukay’s big call on the Owls keepers – in the exact same order with Cameron Dawson leading Joe Wildsmith and Keiren Westwood. Those Owls debuts in the last year: Ash Baker, Cameron Dawson, Alex Hunt, Connor Kirby, Jack Lee, Frederik Nielsen, Connor O’Grady, Matt Penney, Fraser Preston, Jordan Thorniley. That’s without the earlier blooding of Wildsmith and Jack Stobbs. They say you shouldn’t have too many at one time but, individually, the kids have not isolated in being able to draw strength from the numbers. The club is also drawing on that in once again looking forward with confidence. n Kevin Pressman served Sheffield Wednesday as a senior keeper from 1987 to 2004. That’s 17 years. He made 478 appearances. He was at the club as a pro for 19 years and, as a kid, for five years beforehand. That’s 24 years. Unthinkable in the modern game and unlikely ever to be repeated at any level. Pressman, astonishingly as it now seems, was not accorded a testimonial. That, of course, is in no way the responsibility of the current Hillsborough hierarchy. Many Owls fans, responding to Kevin’s appearance on my Sheffield Live show last week, made unsolicited calls for some kind of recognition. It seems sadly too late but he’d certainly deserve it.